Take a double dose of Space Claritin and squat on your mushroom this week as we brave the happy spores to find "This Side of Paradise"! Former Trek producer and lifelong Trek nerd Dave Rossi is back on the show to talk about an episode of Star Trek: The Original Series that represents an early high point for the show. After arriving at colony Omicron Ceti III, Kirk and crew find the presumed-dead colonists to be alive and living in "complete peace". One by one, however, the ... See More landing party succumbs to the euphoric powers of the local flora, are ready to leave their old lives behind, and Kirk must play the serpent in Eden before he loses his crew, his ship, and his friend to Paradise! Great episodes of Trek often have many parents, and on this episode, we pay homage to names like Fontana, Sohl, Senensky, and more. We also discuss the versatility of Leonard Nimoy, the nascent social equality on display in Star Trek, the austere life of a Federation colonist, why the Enterprise crew is the best of the best, the right way to write a precocious character, and the power of the executive producer in weekly TV. 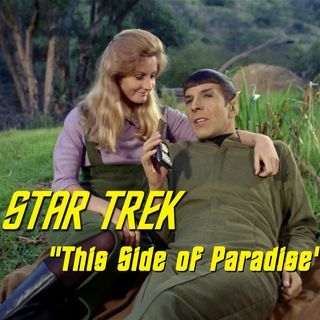 We also talk about the Disney Ranch, Spock's "real" name, the wisdom of eight-year-olds, the liberating effect of the mini-skirt, happy "1.0" Spock, the Samsonite Starfleet collection, Spock's momma jokes, the singles scene on Vulcan, the "convincing" pipe, McCoy going full Foghorn Leghorn, and we take the time to share our first exposures to the world of Trek! Amanda Grayson was a saint! You can pre-order David A. Goodman's "The Autobiography of Spock" on Amazon! Mend picket fences with us on Facebook and Twitter! Buy us a mint julep on Patreon!